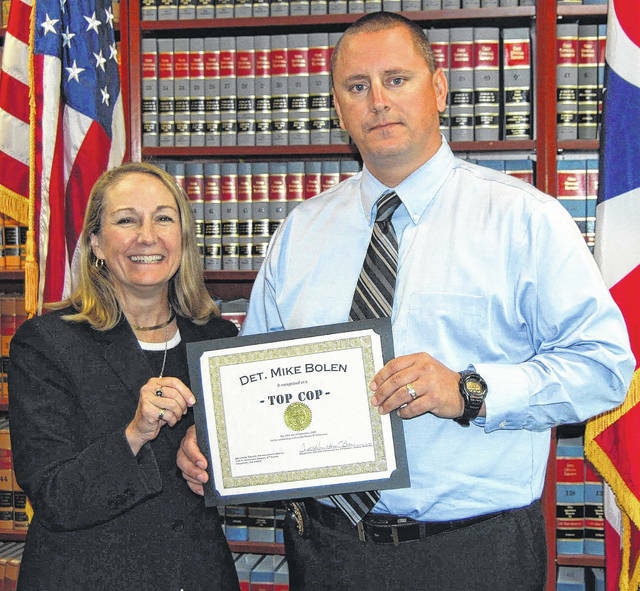 Detective Sergeant Mike Bolen recieves the “Top Cop” award from Delaware County Prosecutor Carol O’Brien in October. In 2000, a slightly sick Cedar Point police officer drove down to Delaware to take a police examination. Seventeen years later, Det. Sgt. Mike Bolen heads the detective bureau at the City of Delaware Police Department. He was recently honored as the recipient of the “Top Cop” award presented to him by Delaware County Prosecutor Carol O’Brien. In his 17 years at Delaware, Bolen has worked as a third-shift officer, a detective, then a sergeant, and said he still loves what he does. Bolen said he had been working as a patrol officer for six years when a temporary detective position opened up in the department. “I had no intention of applying, but my sergeant put my name in,” Bolen said. He said a permanent detective position became available and he applied and was later promoted. Bolen said he also studied social work when he was in the police academy and worked at several organizations where he acted as a mentor or as a job trainer for handicapped individuals. Bolen said one of the best feelings in his job is getting a confession out of a suspect. The main difference between being a patrol officer and a detective is stress and involvement in cases, Bolen said. “When you are on the road, it’s hours of boredom and seconds of stress,” Bolen said. Bolen said the detectives talk through cases with each other to give each other moral and emotional support. Bolen was promoted to sergeant after several years as a detective and was back on the road for years before being promoted to detective sergeant. Personally, Bolen said he wouldn’t be able to do his job without his church and his family. Bolen said he and his wife have been married for two and a half years and said she knows what he goes through as a detective and supports him.